Electric cars: at a glance | What Car? If you're looking for a clear, concise guide to electric cars, then you're in the right place. Forget the information overload that surrounds this emerging technology, we've got the facts that matter on one easy to read page. How much will the electric car that suits you cost - and, more importantly, will it have enough power stored in the battery to get you home? 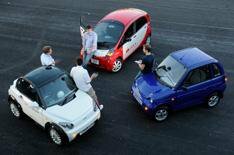 Click below for a larger version of our electric car buyer's guide.